You know the scene: the moon's been up for hours, the neighborhood is quiet, you really should close your eyes and drift off to dreamland...but you simply must read one more chapter! 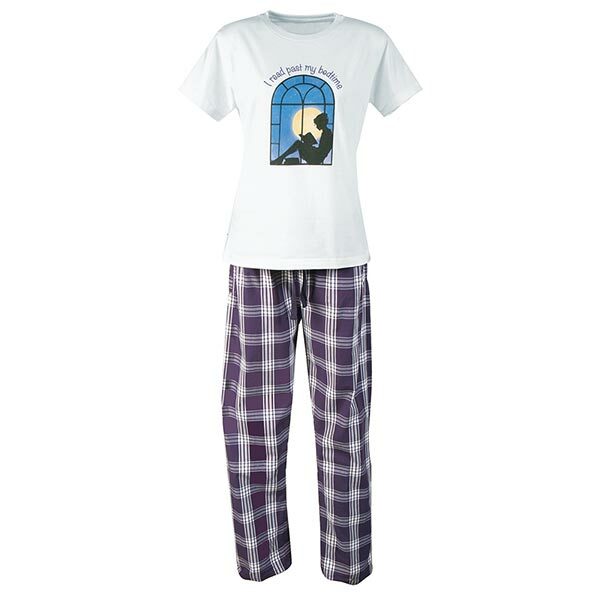 Bibliophilic night owls will love our adorable (and comfy 100% cotton) "I Read Past My Bedtime" Pajamas. The soft white T-shirt top sports a loose-fit ladies' cut and the standard-fit purple plaid bottoms feature side pockets and an elastic drawstring waist. Please specify size for top and bottoms (separately): S, M, L, XL, XXL.